Make this Quick Kick Quesadilla Recipe for a speedy kick of flavor. This quesadilla recipe uses only three ingredients and can be made in ten minutes. 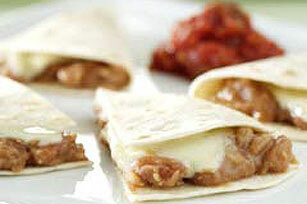 Spread tortilla with refried beans. Top with Singles; fold in half. Place on microwavable plate. Microwave on HIGH 15 to 20 seconds or until Singles begins to melt. Cut into 4 wedges to serve. Serve with TACO BELL® Thick & Chunky Salsa, if desired. Substitute 1/4 cup KRAFT 2% Milk Shredded Reduced Fat Four Cheese Mexican Style Cheese for the 2% Milk Singles.